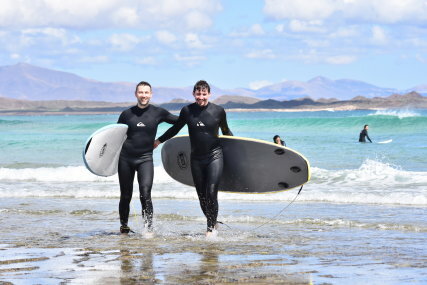 Surfing Fuerteventura is often compared with surfing in Hawaii. The island has often been called the 'Hawaii of Europe' due to its laid back island surf culture, year round consistent waves and 365 days of sunshine. 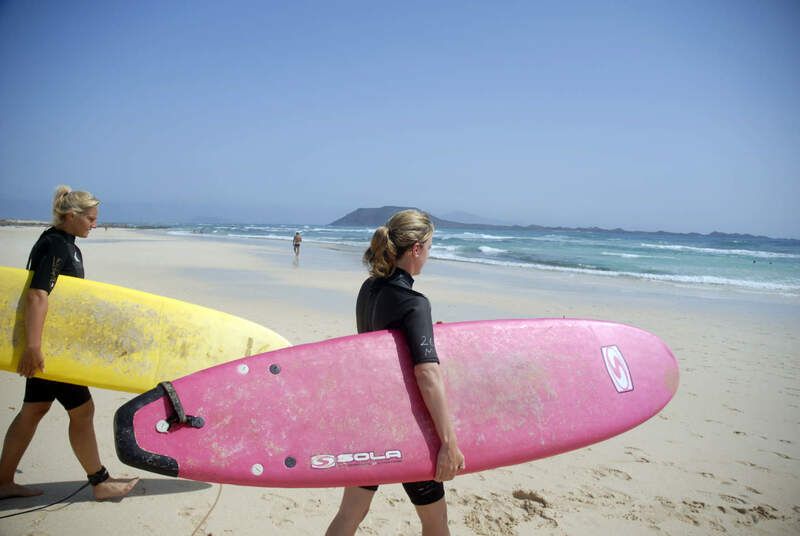 The best parts of the island for surfing Fuerteventura are the East, North and West coast. 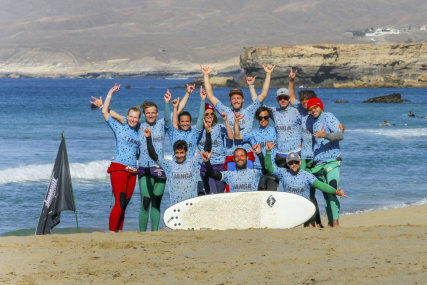 The island is perfect for beginners learning how to surf or for those looking to progress to the next level. Best of all its warm Ocean water means you will be able to wear board shorts or a shortie wetsuit all year round. 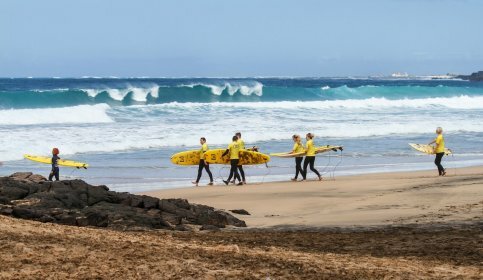 Main Surf Beach: With our mobile surf school we go surfing on the east coast, west coast and north coast of Fuerteventura, so for sure you will be surfing several surf spots and meanwhile see something of the island…. 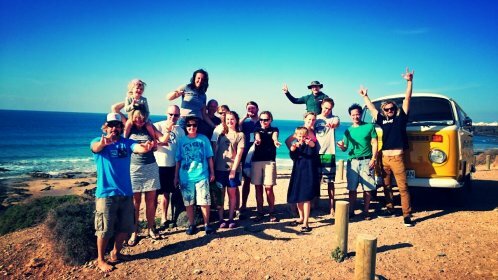 Main Surf Beach: With our van, we go surfing on the east coast, west coast and north coast of Fuerteventura. We will find the best spot of the day according with the forecast and your surf skills. 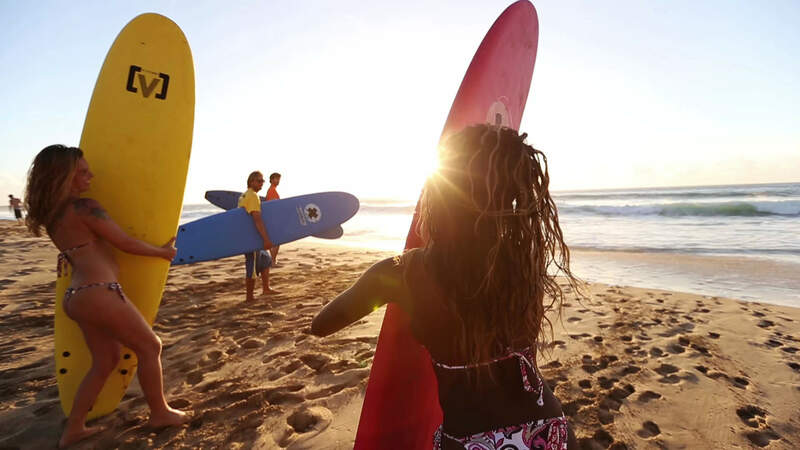 Main Surf Beach: We choose our daily surf spot the day before, based on the weather conditions. 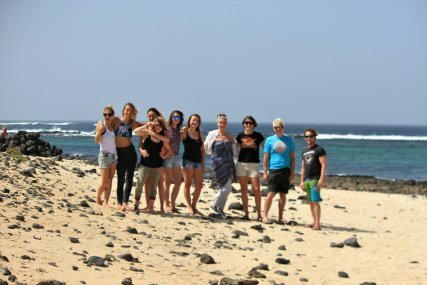 Main Surf Beach: Basically we go to: El Morro in Corralejo, El Cotillo & Playa Blanca in Puerto del Rosario. Fuerteventura is the second largest Canary Island. It was conquered in 1405 by the Spanish. The name has a number of different meanings, Forte/Fuerte means 'strong', and ventura can mean - Adventure/Luck/Happiness/Wind - you decide! The island is relatively low lying and desert like, and is home to more sandy beaches than any of the other Canary Islands. There are more than 150 beaches in the north and south of the island, spread over 340 kilometres of coastline. The east coast is more cliff based with many small, beautiful hidden coves. It is a small island - only 1660km², compared to Ireland's 70,000km² and the UK's 245,000km², so its very easy to explore. It measures 210 kms from one end to the other. The island lies 100kms from Morocco in Africa. Fuerteventura has a number of different towns. The capital is Puerto del Rosario, on the East coast and is home to the airport. Corralejo is the main surf town 35kms north. El Cotilo on the North West coast is a small little village with a beautiful beach. Inland you will find the island's oldest and most picturesque town Betancuria. The southern part of the island is popular with windsurfers - Costa Calma and Morro Jable. 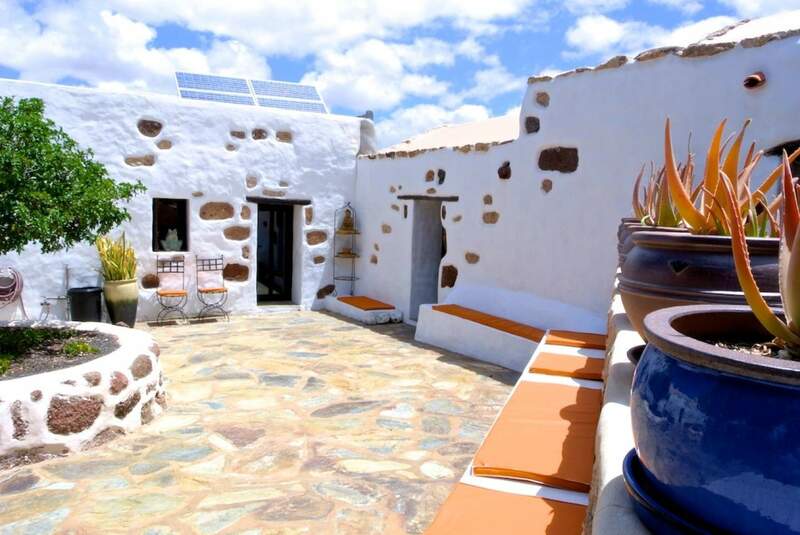 Our accommodation is in Corralejo, the perfect base for a surfing holiday. One of the main attractions of the town is its gold sandy beaches and turquoise waters. Just on the outskirts of town are the fantastic Dunes; they are part of the Corralejo Nature Reserve and create a stunning Sahara like setting that run down to the Ocean. Lanzarote is only 20 minutes away by Ferry, and the Volcanic island of Lobos (a natural reserve) is closer. 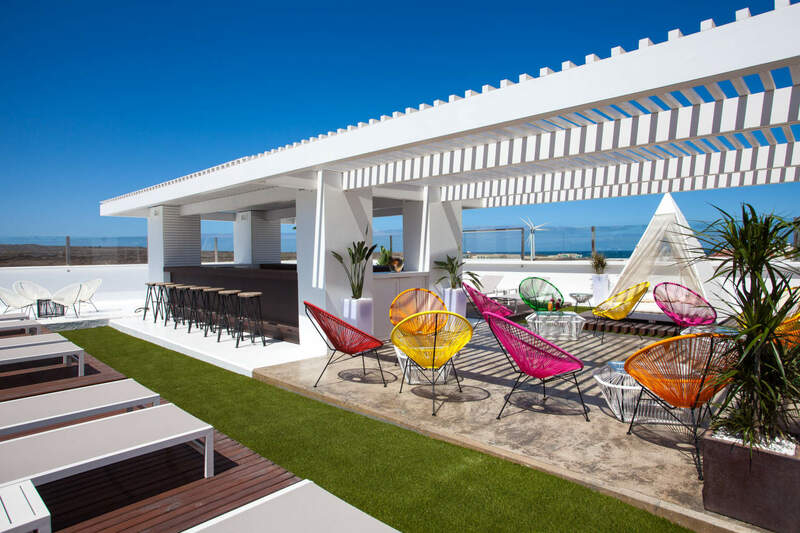 Both add to the spectacular views that can be seen from Corralejo from the beach front area from the harbour wall to Waikiki beach. And unlike other Canary Islands there are no towering apartment complexes ruining the landscape. Fuerteventura is an outdoor adventure paradise. If you want to take a day off from surfing then there are plenty of other options: windsurfing, scuba diving, kiteboarding, fishing, snorkeling, golf, theme parks, cycling and more! Another clever way of getting there is to use some of the chartered airlines. You don't have to stay in the resorts they offer but you can avail of their flights! 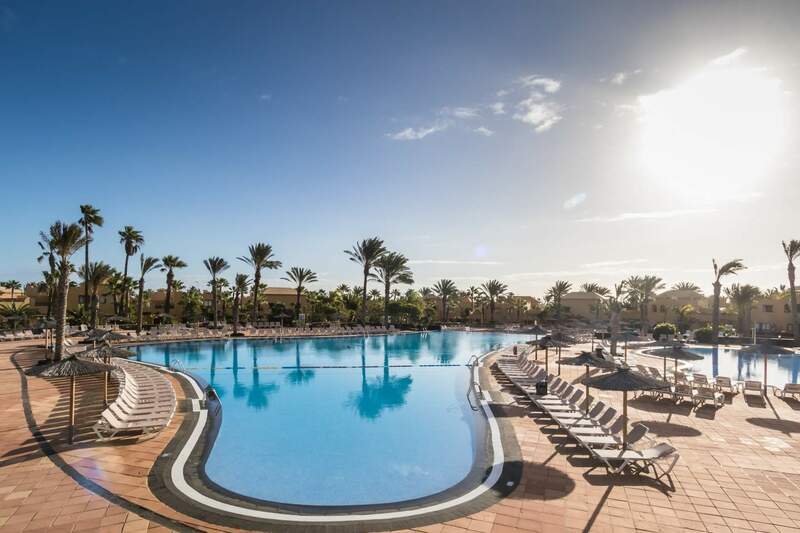 Lanzarote - if you can't fly direct to Fuerteventura then fly to Lanzarote instead. Then get to Playa Blanca (40 minutes drive south) and get the ferry across (20 minutes) to Corralejo where our accommodation is. Car Hire - We have a discount car hire section on our website where you can rent a car. Despite being the second largest of the Canary Islands, Fuerteventura is still a small island and only takes an hour and a half to drive its length. What this also means is that there is always a coast that is working and plenty of empty waves to be surfed! With practically 365 days of sunshine & 25ºC plus weather it has often been called the Hawaii of Europe. Like the rest of Europe the Autumn/ Winter gets the biggest surf and the spring/summer is perfect for beginner/intermediate surf...The Canaries lie 100kms off Africa and are a magnet for North Atlantic swells. The island is known for both expert waves and many mellow beachbreaks perfect for intermediate improvers. Corralejo is often the starting point for a Fuerteventura surf holiday, a perfect base and close to many breaks. The main surf break in town is Rocky Point. Perfect for intermediates, improvers and for long boarders. Further across is Los Lobos island (uninhabited) with a World Class right hand point that runs for up to 400metres. South of Corralejo is beginners surf beach 'Flag beach', close to the famous Dunes. Further south there are many different beaches that pick up good swell. The North Shore is what the island is famous for and where you will find a coastline full of just about every wave imaginable. El Hierro is a great spot - with 3 different sections suitable for intermediates to experts ('The Bubble'). On the North West coast is the small village of El Cotillo, and one of the most beautiful beaches you will ever see. It is a very nice intermediate beach break and also be on the look out as it is a nudist beach in parts.